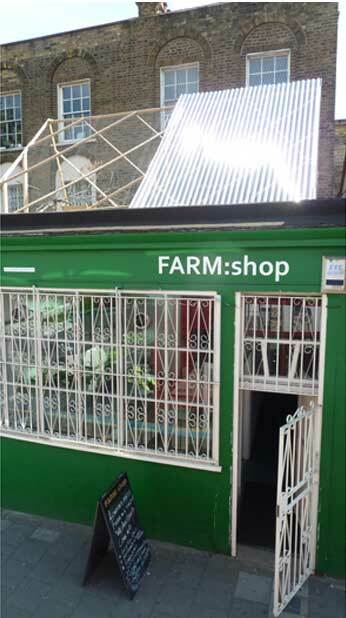 FARM:shop in the heart of hip Dalston is local café, urban farm and London’s biggest aquaponics scheme, all in one. Rachel Smith pays a visit. Number 20, Dalston Lane has iron railings across the windows and peeling paint round the frames. At first glance, it looks like an inauspicious shop front in a line of London terraced houses. Look a little closer though, and you’ll notice some incongruous features alongside the café’s standard coffee machine and cake stands, such as halogen lights and pumps. 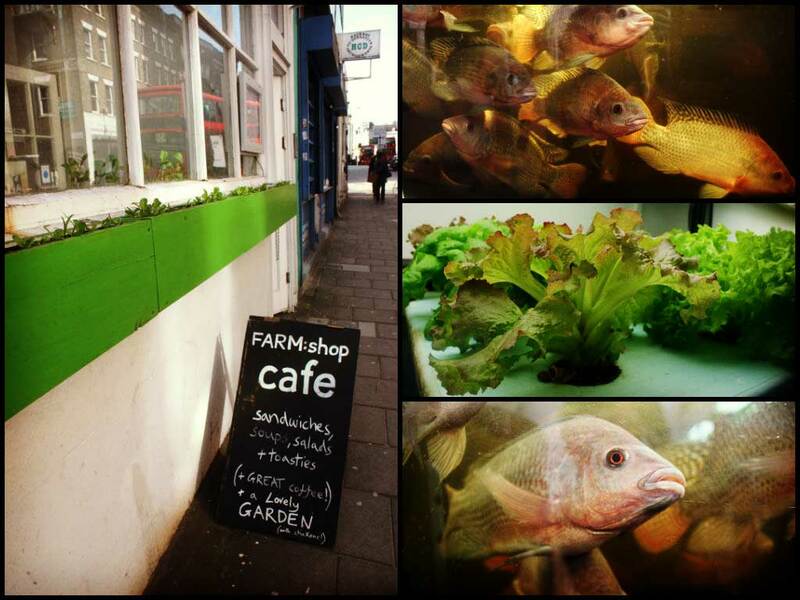 That’s because number 20, Dalston Lane isn’t just a coffee shop; it’s also an urban aquaponics farm. 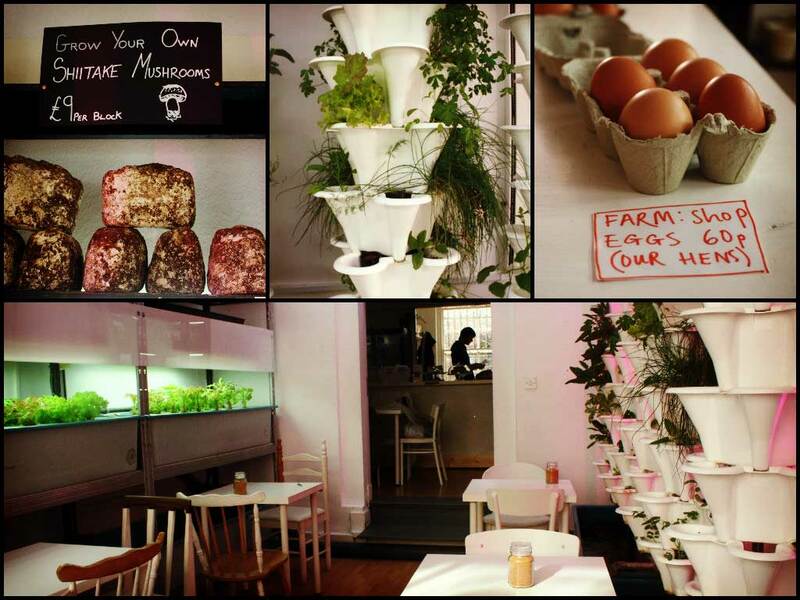 Indeed, the café, called FARM:shop, houses London’s first and largest aquaponics system. Inside, two big tanks contain about 30 shimmering grey tilapia, all weaving past each other, noses gently bumping against the glass. Hydroponic trays are stacked up along the wall, each containing individually planted lettuces and herbs, which are fed via pumps with water from the fish tank. So the tilapias’ role in this miniature ecosystem is purely to provide nutrients for the plants by enriching the water in the tank with their waste. The water is then pumped through to the hydroponic plant trays, where the herbs and lettuces remove the nitrates, and the clean, nutrient-free water is then pumped back into the fish tanks. Consequently the plants need minimal water, and no soil or fertilisers: it’s efficient, sustainable and all rather neat. “Once it’s up and running, and the right bacteria is in the system, it looks after itself,” says Andrew. “You occasionally have to top up the water and the iron levels, but otherwise all you have to do is feed the fish.” Sometimes aquaponic schemes such as these use ornamental fish. “Goldfish still poo,” laughs Rasbery. But tilapia is the favourite choice, for several reasons: they are hardy, resilient to disease and happy to be kept at high density, if necessary. They are also delicious and can be grown to harvest in just six months, which means that, with the necessary registration from Cefas (Defra’s Centre for Environment, Fisheries and Aquaculture Science), it’s possible to create an aquaponic scheme to farm fish as well as plants. The term aquaponics comes from combining aquaculture (farming fish) and hydroponics (growing plants in water, without soil). It’s not a new idea. There is evidence of early hydroponic schemes as far back as Ancient Egypt and Mexico’s Floating Gardens of Xochimilco, while Chinese farmers started introducing fish to rice paddies in 3000BC, both to fertilise the water and eat the insects that would otherwise eat the plants. Back at FARM:shop, the future is uncertain. 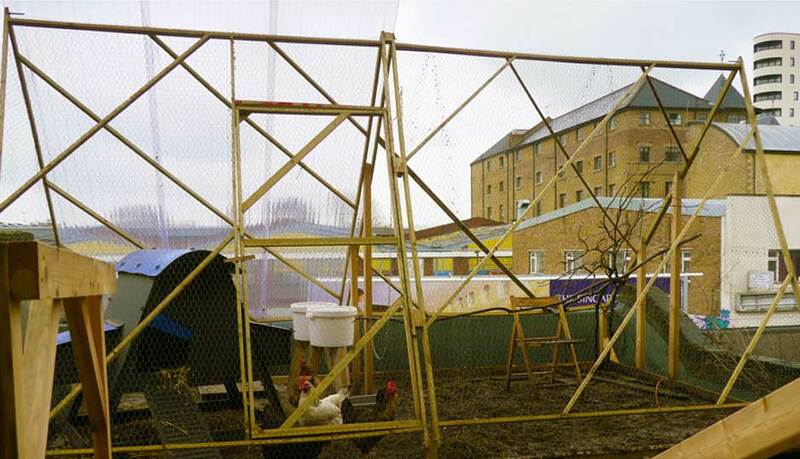 The café launched in 2011 with funding from Hackney Council’s Art in Empty Spaces scheme: the founders, a collective known as Something & Son, cheekily described the aquaponic farm as an art installation, called “Mixed Media: 15 x 7 x 12”. But there is no guarantee that their lease will be renewed. Something & Son are already searching for a solution though, and they’re thinking big: a 3,000 square metre urban farm on a London rooftop, using the same aquaponics approach, plus poultry and high yield mushroom growing too. All of which provides a smart alternative for those on the waiting list for an urban allotment: vertical walls of soil-free, hydroponic lettuce, powered by a tank full of tilapia, all in the comfort of your own home. Top picture and chickens on the roof © Something & Son. All other pictures by Rachel Smith.